Salvatore Ferragamo was one of Italy's most famous luxury shoe designers and the company continues to make designer shoes with the addition of luxury clothing, handbags, and accessories. Based in Florence, the Ferragamo Company also has hotels, restaurants, and a museum. The Ferragamo Shoe Company was founded in 1928 in Florence and in 1938 it acquired Palazzo Spini Ferroni, a 13th century mansion on Piazza Santa Trinita, where the store, company headquarters, and museum are still housed. Ferragamo also has stores in many cities around the world. In Florence, the original Ferragamo Store and Museum is in Piazza Santa Trinita on the corner of Via dei Tornabuoni, Florence's main street for high fashion. Inside the luxurious store are high end shoes and designer fashions. 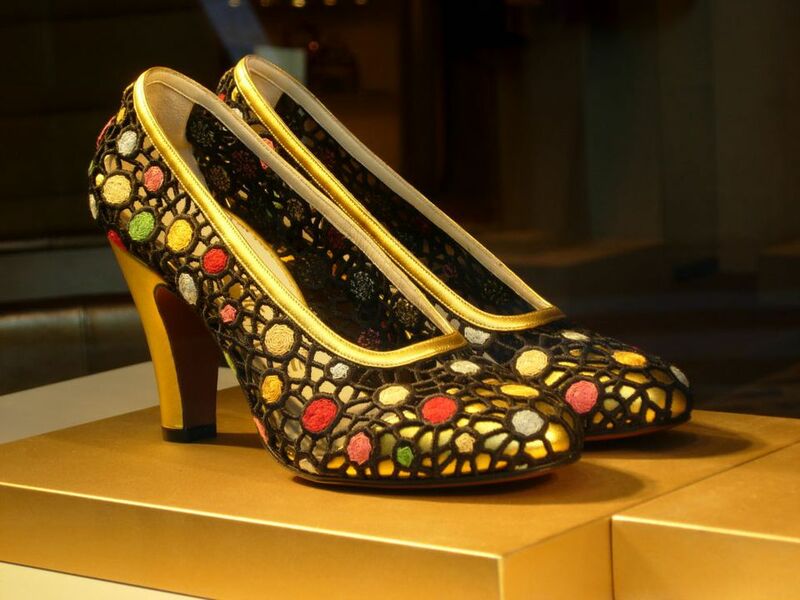 Below the store, the Salvatore Ferragamo Museum features a changing display of the collection of shoes designed by Salvatore dating from 1927 through his death in 1960 and the company's footwear production through the present. There's also a gift shop and special exhibitions are held throughout the year. The museum is open daily from 10 - 19:30 except the holidays of January 1, May 1, August 15, and December 25. Admission in 2013 is 6 euro and the money is used to finance scholarships for beginning footwear designers. The Ferragamo Company owns several high class hotels in Florence, part of the Lungarno Collection. They feature Salvatore Ferragamo bath amenities and offer free access to the Ferragamo Museum and Hotel Continental Fitness area. Hotel Lungarno sits on the left bank of the Arno River (across the river from the Cathedral), very near the Ponte Vecchio, Pitti Palace, and Boboli Gardens. Riverside guest rooms, the hotel's creative restaurant, and the lounge have magnificent views of the bridge, river, and city. Rooms are luxuriously furnished and common rooms of the hotel are decorated with many works of art. Read more in this Hotel Lungarano review on our Honeymoons and Romantic Getaways site. Borgo San Jacopo Ristorante is recommended by author Dianne Hales. Portrait Firenze, a small luxury hotel overlooking Ponte Vecchio, is the newest Florence hotel in the Ferragamo collection. Hotel Continentale is a 4-star hotel with spa next to the Gallery Hotel Art. La Terraza Bar (open 4PM to 12PM), on the top floor, is one of Florence's top view spots and its lobby has a fireplace and photos by Florentine fashion photographers. The 43 rooms and suites are decorated in white. Gallery Hotel Art is a 4-star contemporary design hotel on a side street near the Ponte Vecchio, Salvatore Ferragamo Musuem, and Uffizi Gallery. Rooms and common areas are decorated with art, the rooftop terrace bar has great views of the river and city, and the restaurant has a fashion display inside. Two of the Ferragamo hotels have a restaurant. In the Hotel Lungarno, Restaurant Borgo San Jacopo is a highly acclaimed restaurant featuring creative Italian cuisine and views of the Arno. Fusion Bar and Restaurant, in the Gallery Hotel Art, serves contemporary fusion food inspired by Asia daily for lunch and dinner. Next to the Salvatore Ferragamo store is one of the company's newest creations, Il Borro Tuscan Bistro, Lungarno Acciauoli 80r at the corner of Via dei Tornabuoni. The bistro is a wine bar, store, and restaurant featuring local products and creative dishes, open daily from 10AM - 10PM. We saw these Ferragamo places on a walk through Florence with our Florentine friend Piero. Here are his suggestions for places to shop and places to eat and drink like a local.